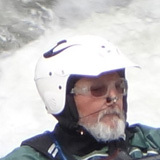 On September 20th, 62 watercraft challenged the mighty Gauley River in the 18th Annual ANIMAL Gauley Race. There were 62 watercraft in the race, including wildwater boats, long glass and composite boats (over 8'6"), long plastic boats boats (over 8'6"), playboats (8'6" and under), rafts (R-6, R-2 and R-1), OC-1s, IK-1s and riverboards. The starting line was just below Summersville Dam and there was a mass start for each class listed above. The finish line was the upstream edge of Postage Due, the large rock on river left below Sweets Falls. A few names familiar to Wildwater racing were prominent in the race. Geoff Calhoun paddled his wildwater K-1 to an overall winning time of 48:15. Chris Hipgrave had a time of 54:02 (7th overall) in a LiquidLogic Stinger K-1 and Jack Ditty finished with a time of 54:30 in his Wildwater C-1 (9th overall).